First Man Review - Are You Screening? After the incredible, and rather surprising, success of Whiplash and La La Land, director Damien Chazelle teams up with La La Land star Ryan Gosling for a film that is perhaps just as strange in its subject matter, First Man. It isn’t obvious that Neil Armstrong and/or the his trip to the moon is a strange subject in the same way that an unlikable drum teacher or a jazz musical in L.A. stand out as risky efforts, but this particular look at Armstrong, outside of a documentary, is a challenge at the very least. The film begins with Armstrong in a test flight that takes him out of the Earth’s atmosphere briefly, and it soon jumps to the death of his daughter. It quickly becomes apparent that these two things – the space race, and the loss of his daughter – become all but the sum total of Armstrong. As he goes through the rigors of training to fly what amounts to a rusty bucket into space, he slowly enters a kind of permanent disassociation from life in general, and most especially the particulars of his own. There is a wealth of material for viewers to digest and pull depth from as though his life were some lost work of Aesop, but the film only vaguely hints at these things. You may work out the life lessons and tragic insights inherent in a haunted, stoic man who spends his life running flat out at a job/dream that will probably kill him so that he doesn’t have to think about anything else, but it isn’t really because the film gives it to you any more than a short synopsis of the plot would. You could piece together right now a rather chilling idea of what living in his wake means, and what it’s like to survive the aftermath of his single-focus existence, whether as his wife, or one of his two sons, but it isn’t because this writing delivered it. First Man is so concerned with weaving a story about the man and his family into the fabric of an overworked nostalgia vehicle bombarded with shaky camera shots and several minutes staring at the screws holding the rockets together that it never actually delivers any story at all. Pressed for time, because so much is dedicated to watching rockets take off, crash, or roll uncontrollably, the film turns up or dials down every emotional effort in an attempt to sell the point more quickly. Stoic becomes Vulcan. Sadness becomes personality loss. Worst of all, the film becomes a kind of carousel, taking us through the same routine over and over, just with new people lost, new names on the rockets, and a blanker and hollower stare coming from Armstrong. Gosling manages a couple of scenes that prove he can give you an incredible amount of information when doing very little, but most of the time he isn’t even given very little to do. It’s actually something of a blow to the experience to see how good he can be. When he gives us his precisely controlled response in an interview, and makes it magically clear that the person asking the question just came extremely close to death, it only serves to make you long for what might have been had the film allowed us an Armstrong who wasn’t so robotic. It’s still powerful enough, but it’s as much a result of an unavoidable accident as the effort of the cast and crew. 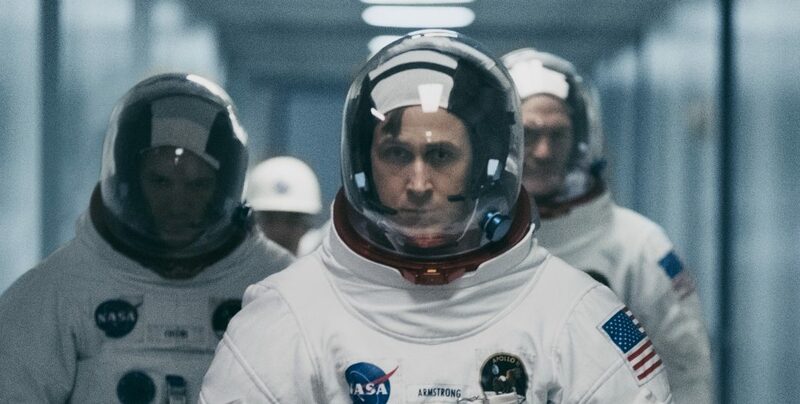 Any telling of this mind-boggling adventure is deliver a certain amount of emotion, and showcase human determination as few other things can, but First Man is a film that is almost working against itself because it can’t decide what story it wants to tell. In the end, we watch (for a long time) Armstrong do something, and it should be an evocative juxtaposition that tears at our souls, but we haven’t watched the movie that needs to come before it. Not really. Armstrong may well have been so broken by the death of his daughter that his drive became the only light he could see. As people he knew seemed to endlessly fall around him, he may have simply imploded into himself, ultimately becoming an oddly boring automaton on a mission, unwilling or unable to register the fact that he had a wife or sons. But, if it is, and you want me to actually take something away from his story, tell me an interesting lie.